“With drunk driving resulting in roughly 1 million arrests, 10,000 deaths and $44 billion in economic damage each year, we released an in-depth report on 2017’s Strictest & Most Lenient States on DUI.” WalletHub explained. Texas is #13 on the strictness sale. In Texas there were 987 fatalities due to DUI incidents in 2016. In 2016 Hopkins County had 39 DUI crashes, specifically 8 were in Sulphur Springs. To view the full report from TXDOT click here. This map shows the ranking of the 2017’s strictest and most lenient states on DUI laws. KSST contacted local law enforcement to find out how Sulphur Springs and Hopkins County compares to the entire state. Lt. Crump explained the difference between a DUI and a DWI. “DUI is driving under the influence. DWI is driving while intoxicated.” Some states only use one classification but “Texas has both. 10 years ago, TX [legislature] created a DUI minor charge.” DUI’s can only be issued to people under 21 with a Blood-Alcohol Content (BAC) above .00. “It is a class C misdemeanor, and [the offender] receives a ticket and it would go on their driving history.” The misdemeanor would become a felony prosecuted by the District Attorney if: there are kids in the car, or if it is the 3rd offense (2 previous convictions). Lt. Crump estimated 75% of the DUI’s are misdemeanors, while 25% are classified as felonies. Additionally prescription drugs and illicit drugs, can impair a drivers ability to safely operate a vehicle, and you can be arrested for a DWI if you are under the influence of drugs as well. The legal limit for persons 21 and over is .08, however even if someone is under the legal limit but can’t complete the sobriety test or are a danger to operate a motor vehicle safely, they can still be considered for a DWI. 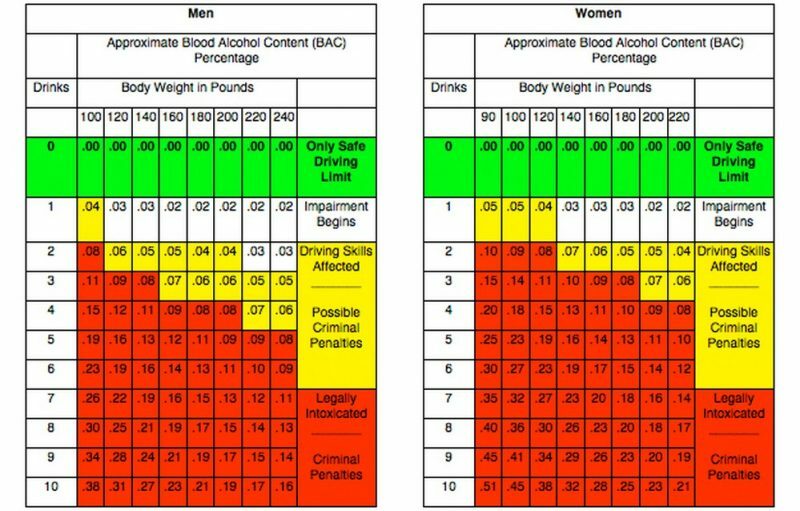 Use this chart as a guideline for safe drinking. Mothers Against Drunk Driving Sulphur Springs president, Becky Hicks, has been putting on an awareness walk for Hopkins County “Walk Like MADD”. “Drunk driving is 100% preventable. It’s not don’t drink. It’s don’t drink and drive.” The walk is about “the victims and educating the public. We put out pairs of shoes that represent the deaths.” 2 years ago they laid out 1,360 pairs of shoes. Last year they put out 1,067 pairs, and this year they will put out 987 shoes. “Walk money goes towards victims, power of the parent, and educating the public. Form teams, remember victims, have fun, and raise money for a good cause.” North East Texas’s Walk Like MADD is on September 30th, from 5:00-6:00 pm. For registration and more information visit the Walk Like MADD website.